I’ve been in 40 years of staff strategy sessions in which every plan seemed to be infallible. There’s no way they can stop us… However, the late Harry Gamble taught me a very valuable lesson regarding game plans. When Coach Gamble was the Head Coach at the University of Pennsylvania & I was young offensive coordinator with all the answers; I came up with a fool-proof, infallible, game plan. It was a sure thing. Coach Gamble, with the patience of a saint, looked at me & said “Tony, they have chalk too. You’re not the only genius in the Ivy League”. Point made. Since then I always Hoped for the best, but planned for the worst. I always made sure I had emergency game plans ready. I had disaster game plans. 2. Kill the clock Situations needing a first down or two to finish the game. But I felt the need to develop “disaster plans”. The first time I was faced with being behind by a large margin I completely blew it. I tried to use a face-paced no huddle approach on offense & blitzed & gambled on defense. The result: a big deficit got bigger. I tried to put out a fire with gasoline – a very valuable lesson learned. 1. Comebacks start on defense. We must slow our opponent’s offense down & play scorched earth on defense. Win one down at a time. 2. On offense – get a first down. There are no 21 point plays. Slow the game on offense to give your defense a chance to regroup. This seems counter-intuitive but your offense has to put a drive together to get back in the game. Go with your best plays, stay calm & chip away at the lead rather than trying to make a one play comeback. 3. Keep your team calm & they must believe in the 4th Quarter win. They just have to be in position to win with 6 minutes to go in the game. 4. Practice this situation. Just like pilots practice disaster situations. Sully’s miraculous landing of a plane on the Hudson River had been practiced by Sully many times on a flight simulator. The result was that our teams over the years had numerous big comebacks that would have seemed out of reach especially by an option team. 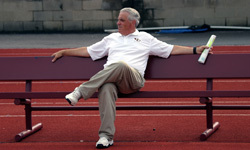 Our first year at the University of Charleston, 2005, we trailed a team picked 2nd in our conference 24-6 at the half. We were picked last in our conference but we executed our disaster plan & came back to win 39-34. This was the defining win we needed to turn our program around. We finished the season 8-3 the biggest turnaround in conference history. I’m not recommending to fall behind by a large margin but if it happens the game isn’t over. You have an opportunity to have a memorable win. Remember: Crisis creates heroes. But you must be prepared for the crisis.